I have to get up real early at 0600 to get my 0750 train to Yogjakarta, my transit point to the UNESCO World Heritage Site of Borabadur. The Indonesians have figured out a way to squeeze even more money out of the rich (assumed) foreigners by offering a sunrise or sunset tour for the low low price of Rp335k. 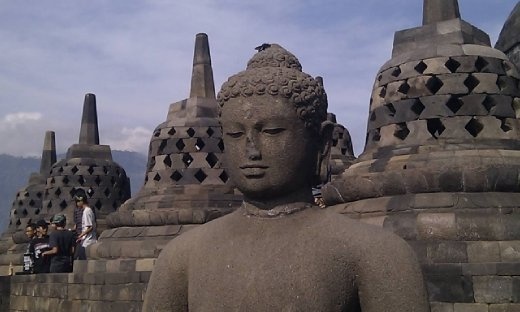 The tour is only available from the Manohara Hotel who have a monopoly on outside visiting hours and are located inside the archaeological site. I, as a fool, am ready to pay for this. Arriving at Yogjakarta train station, I'm outraged to discover that I have to pay Rp200k for a taxi to Borabadur and even more outraged that this is a fixed price for all taxis. Then to really round off the day, when I arrive at Manohara Hotel at 1800, I find out that my booking was never confirmed despite their confirmation email. At least I managed to find another hotel within walking distance of the site. The next morning, I've set my alarm at 0500 for the sunrise tour, promptly stopped the alarm thinking, £$%^ the sunrise tour and went back to sleep. I still managed to get to the site by 0800, at least an hour before the hordes of tourist descend. I spent about 2 hours just viewing the different levels of the building. I'm done and the hordes of tourists are making their presence known, making me glad that I took the effort to get in early. One thing to note. The touts here are bloody persistent. Even when I'm plainly ignoring them, it take a couple of minutes before many of them get the message.